The Weller® WLC100 solder station is ideal for the professional, serious hobbyist, or kit builder who demands higher performance than usual of a standard iron, but without the high cost of an industrial unit. Power is adjustable from 5 to 40 watts. Includes 40 watt pencil iron. UL approved. Net weight: 1-3/4 lbs. Replacement sponge #372-118. • Power is adjustable from 5 to 40 watts. The new, innovative WES51 is an ideal station for continuous production soldering, and its economical price makes it a good station for occasional users. ESD Static sensitive grounded slim profile iron accepts the new miniature tips for surface mount soldering. 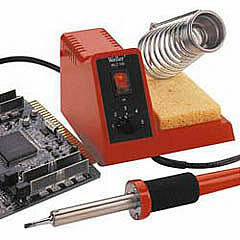 The 24V soldering iron includes a new heater and sensor combination that allows for relatively quick heat-up and recovery. Temperature is adjustable from 350(0)F - 850(0)F. Temperature stability +/- 10 deg. Includes 50 watt Slim Profile Iron. UL approved. Temperature lockout and tip temperature offset ability come standard, as does an automatic shut off feature that extends tip, iron, and station life. 4 foot long three wire grounded power cord. Net weight: 4-1/2 lbs. Power consumption: 60 Watts. Includes integral sponge and holder. Replacement sponge available. Designed for industrial use, the Weller WTCPT soldering station is a transformer powered station, complete with a temperature controlled soldering iron and choice of 600Ø, 700Ø, and 800Ø tip temperature. Special "closed loop" temperature control is employed to protect sensitive components. Features include burn resistant silicone rubber cord, impact resistant housing, quick disconnect plug for iron, lighted on/off switch, and water reservoir. UL listed. Net weight: 4 lbs. Made in the U.S.A.
• UL listed. Net weight: 4 lbs. Made in the U.S.A.